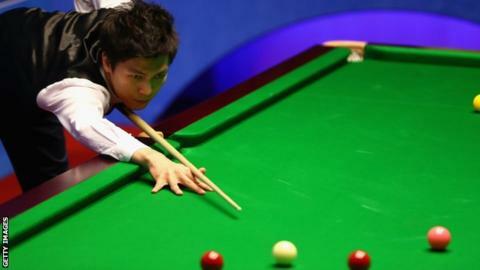 Thailand’s Thepchaiya Un-Nooh made only the third 147 of the season in his opening frame at the English Open. The world number 64 cleared the table on his way to a 4-1 first-round win over Iran’s Soheil Vahedi in Crawley. The 33-year-old will earn at least £15,000 at the ranking event for the second maximum break of his career. Un-Nooh has previously missed final blacks on 140 at the 2015 UK Championship and again at the 2016 World Championship qualifiers. Scotland’s four-time world champion John Higgins reached the second round with a 4-1 win against China’s Li Yuan, as did world number five Judd Trump when he beat Finland’s Robin Hull 4-1. England’s Jimmy White beat another Chinese player, Lyu Haotian, 4-2, while top 20 players Mark Allen of Northern Ireland, England’s Stuart Bingham and Scotland’s Stephen Maguire also advanced. In the evening session, Englishman Judd Trump eased past Robin Hull 4-2, while former world finalist Barry Hawkins thrashed Peter Lines 4-0.